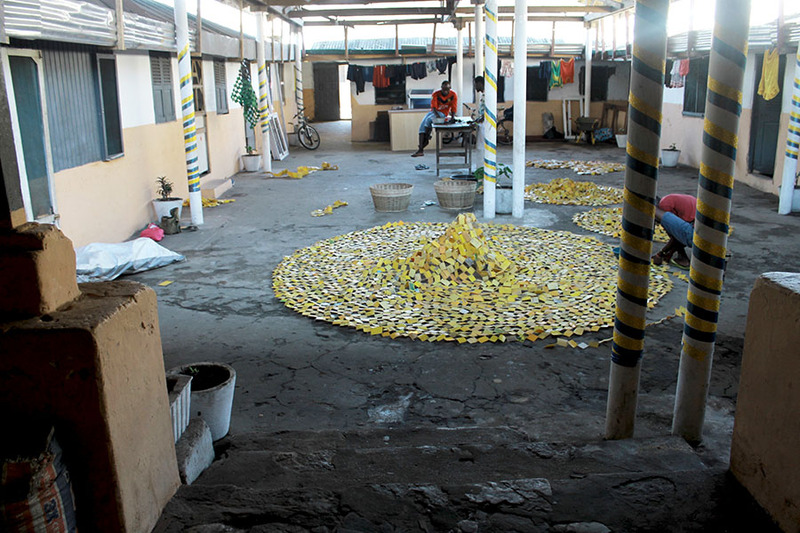 Serge Attukwei Clottey and his Afrogallonism movement address the topic of migration through the use of yellow plastic gallon containers. The jerrycans, first filled with oil, travel from Europe or America to Africa, where the oil is used, and are then re-used to store water, after which Attukwei collects them and transforms them into pieces of art in his studio in Ghana. They are then transported back to Europe/America to be exhibited, coming full circle and completing the cycle. 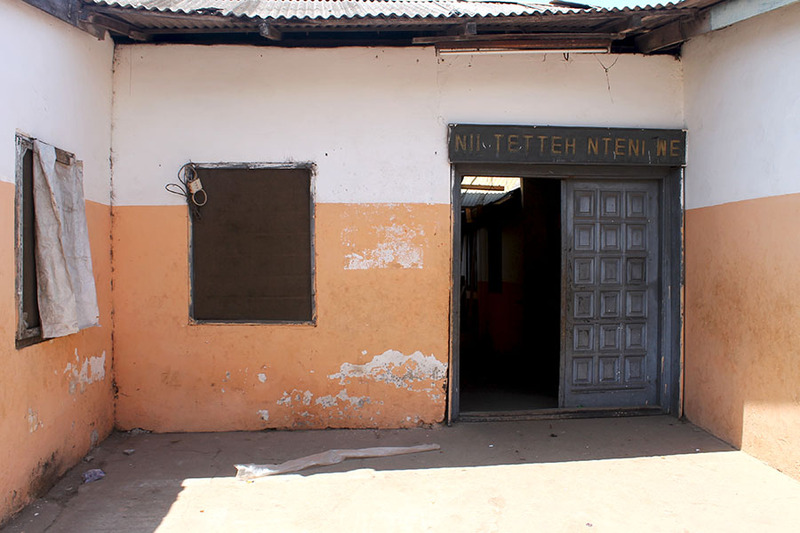 Attukweis studio is in his father’s family house in the Labadi neighborhood of Accra, Ghana. I had the opportunity to intern at the studio for about three weeks and – being used to western studios that tend to be more spacious and quiet – this was a fascinating and completely different experience. Through collaborating with the assistants and speaking to the neighbors, I learned a lot about the influence art or an artist can have on their community. Attukwei’s goal and message are ambitious: teaching poor uneducated young members of the community about big political topics through art. I believe that he manages to create a positive space where these young adults have the opportunity to be free and creative. Often they are unaware of the effect this has on them, not considering themselves artists or creatives but, in my opinion, they most certainly are. 1. Entrance to family compound house. The first people I met when I arrived are two of Attukwei’s assistants: Otu (one of his cousins) and Ashai (a neighbor). They are busy working with the characteristic yellow gallon containers while the artist is hard at work planning future exhibitions, interviews and performances. 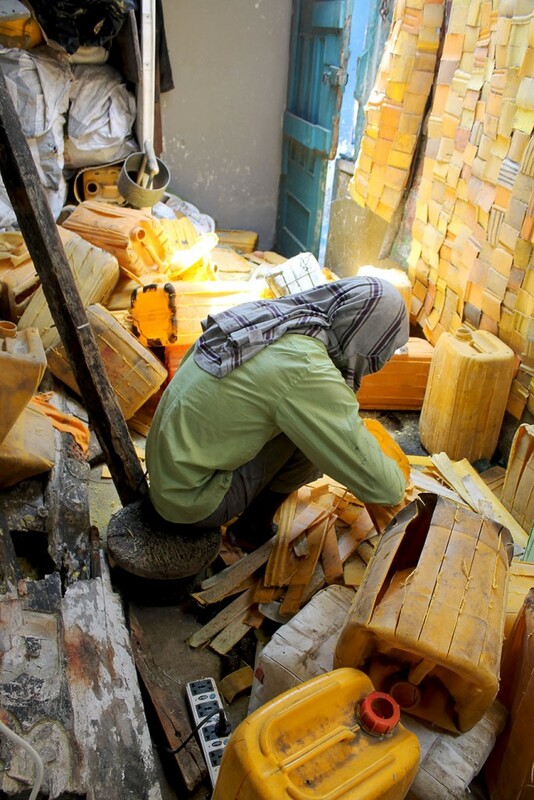 The containers are collected from a dumping site on the beach and brought to the studio where they are cut into pieces and further processed to form big yellow structures. 3. One of the studio assistants busy sawing gallon containers into pieces. 4. Parts of gallon containers are stored in a room next to the studio. The pieces of container are then either melted down together to form the art works or connected using metal threads. 5. Otu is busy melting parts of gallon containers outside in an alley next to the studio. 6. Ashai, a hardworking young assistant, teaches me how to connect the pieces of container with metal thread. 8. The assistants working in the courtyard of the family compound. Attukwei gives his assistants a lot of freedom. 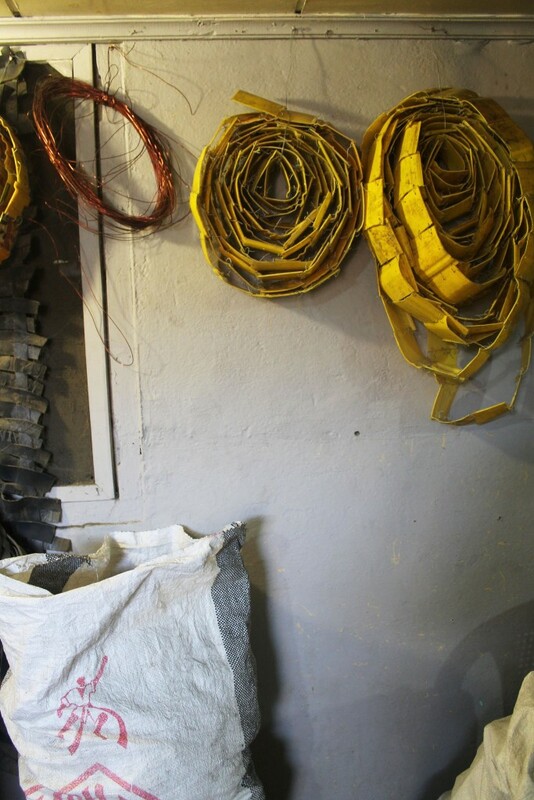 After two years of working together, they know what Attukwei likes and how he would like each piece to be made. 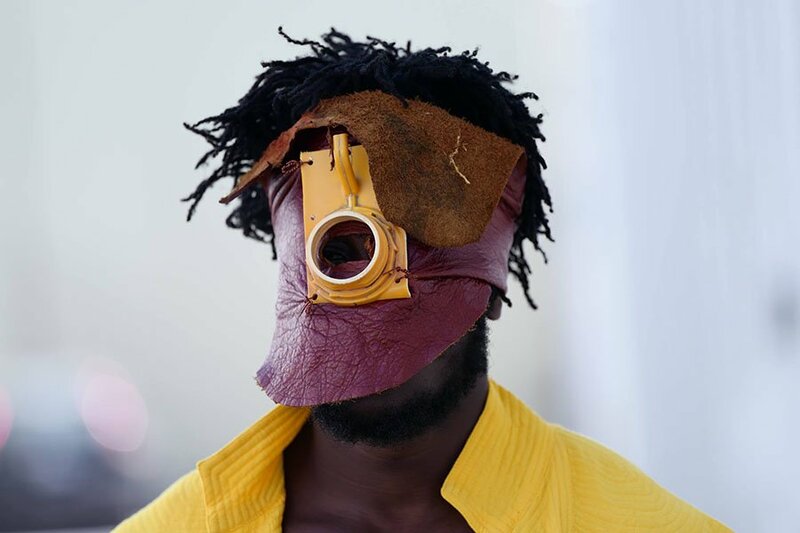 However, Attukwei also wants them to think for themselves, letting them experiment with different techniques, shapes, sizes, and colours. 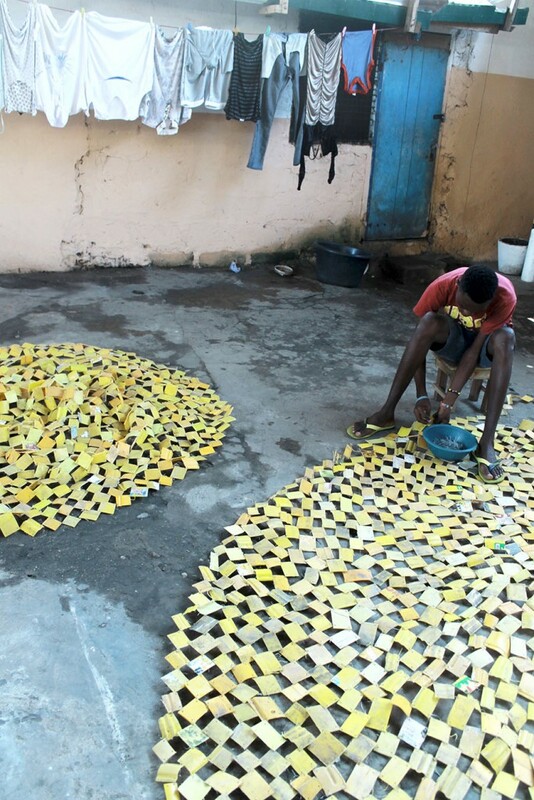 At the beginning of the process he gives them an idea of what he would like, they then put together the work, after which Attukwei finalizes the pieces. 9. Otu looks at a piece he has been working on. 10. The assistants discussing about the art work. 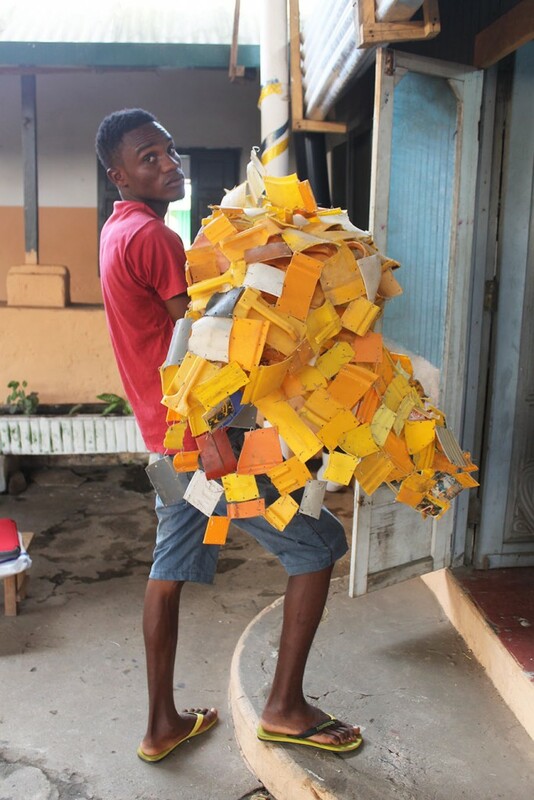 Occasionally, young men from the neighborhood who work for Attukwei, come to check on the artworks. 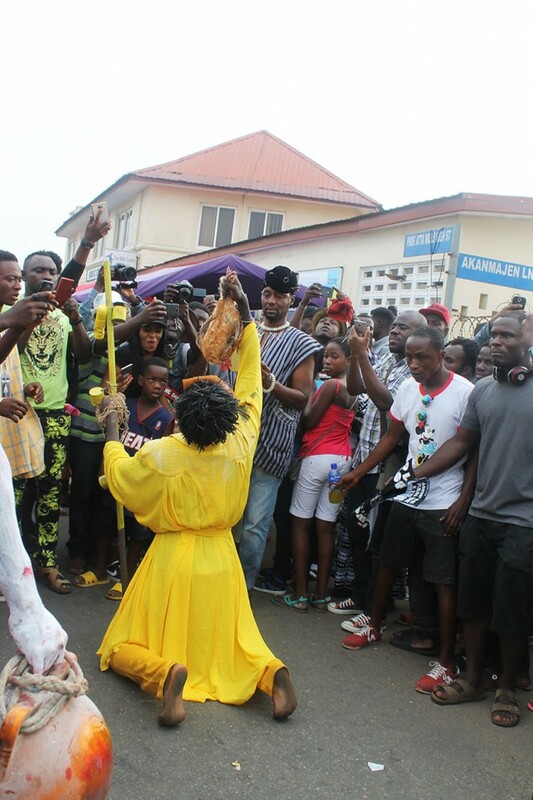 Most of them are part of Attukwei’s GoLokal or Afrogallonism performance collectives. 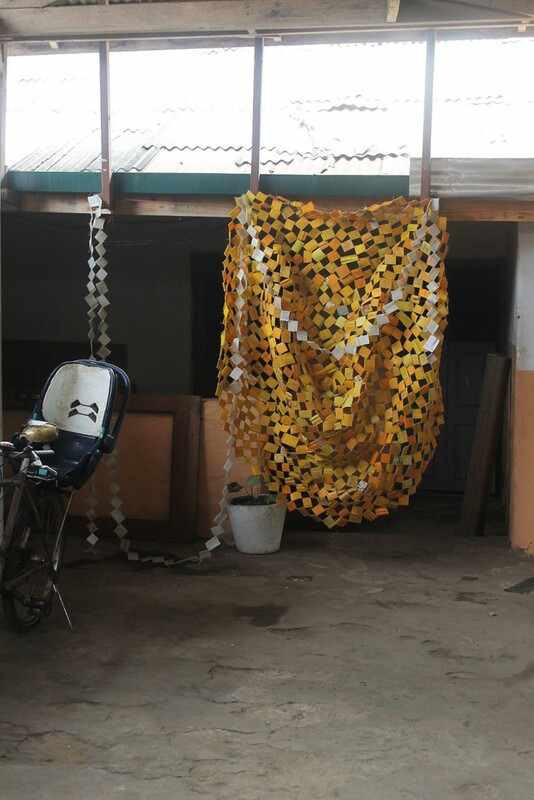 Neighbors also come to hang out in the courtyard, which gives the studio a certain charm and shows how engaged the community is with the project, something Attukwei believes is really important. 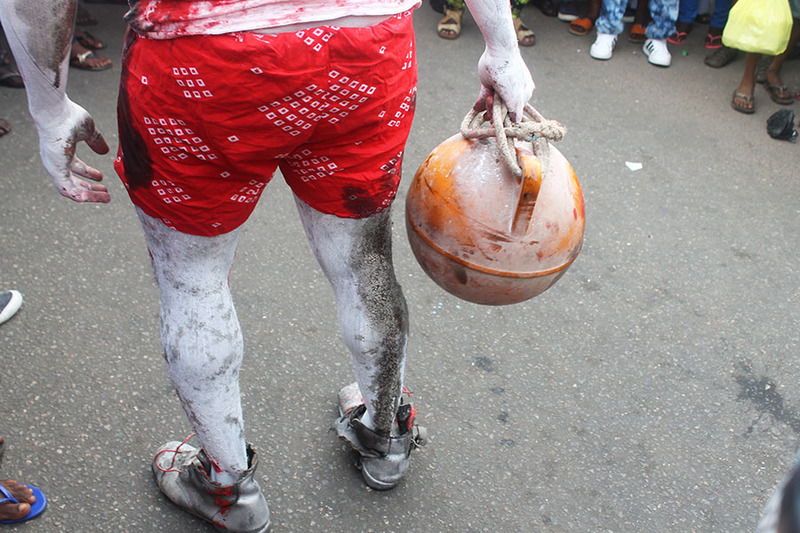 The neighbors and assistants are also part of Attukwei’s GoLokal performance collective which I saw perform during the annual Chale Wote Street Festival held in Jamestown. 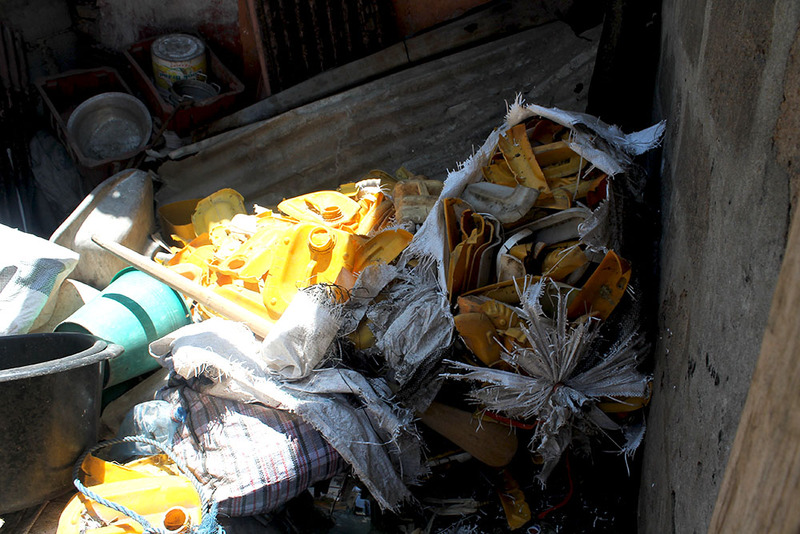 During the performance revered objects play a big role, not only the yellow gallon containers. Attukwei wants the members of his collective to start to think about alternative ways of dealing with the materials instead of just throwing them into Labadi’s gutters. 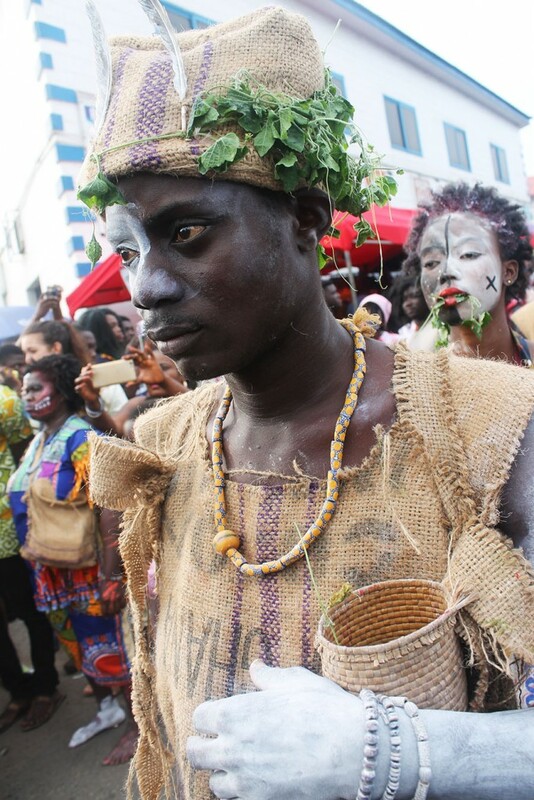 11.One of the members of the Golokal collective during Attukwei’s performance at the Chale Wote Street Festival, 2016. 12. Detail of the performance costumes. 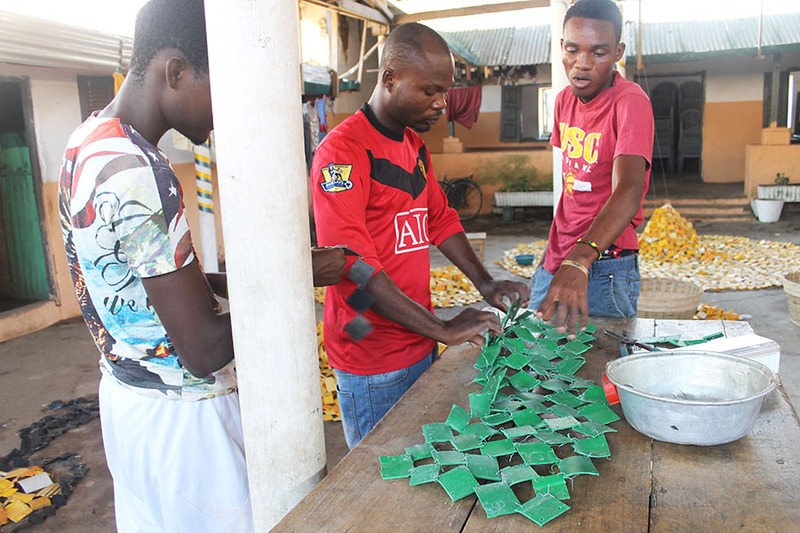 The community easily connects with the art and can relate to it because they are familiar with the materials being used. Attukwei decides a topic for each performance along with the choreography, the members then discuss the topic, each member then makes their own costume based on these discussions. 13. 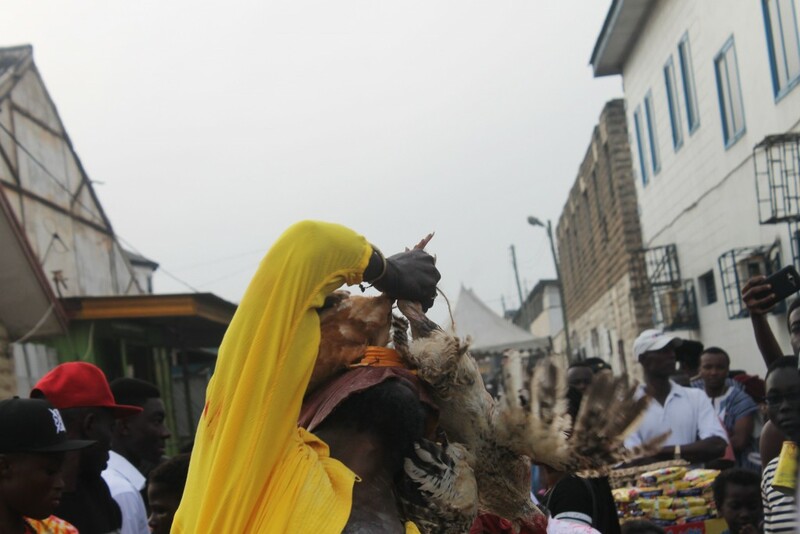 Serge in action during Chale Wote Street Festival, 2016. 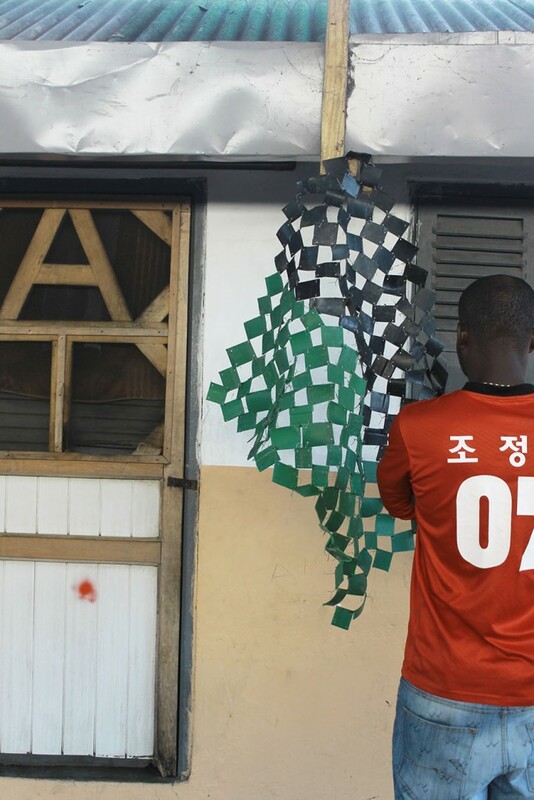 Attukwei wants to show his work to the community first – usually through performances – before the work goes to gallery spaces to be exhibited. His preferred audience is one who is not necessarily interested or familiar with art. He does not think it is necessary to explain his work to people who are not used to looking at art. The Artist engages with them on a more elementary level, as they are familiar with the movements and the materials. In fact, there are many elements that can be understood by anybody and everybody. 14. The audience becomes part of the work by engaging with it such as taking pictures and selfies. 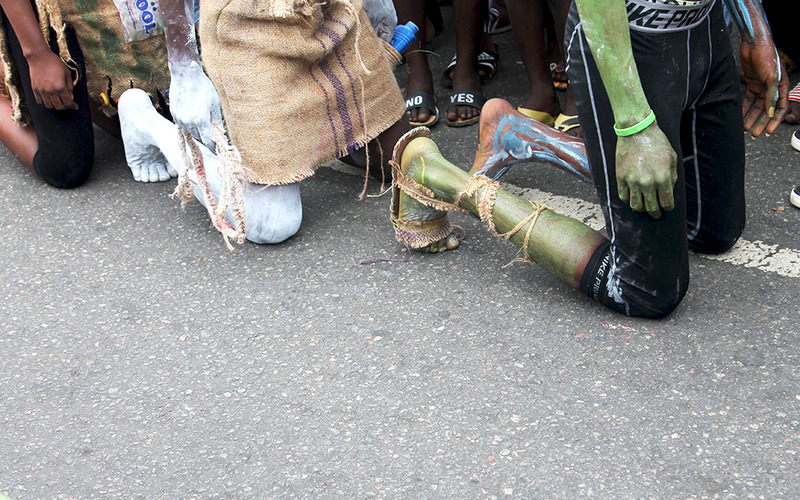 Attukwei’s mission is to engage the community through performance. He invites them into his studio to show them the process that goes into of making each of the artworks. The process is a fundamental part as it engages people, the final pieces are of lesser importance. 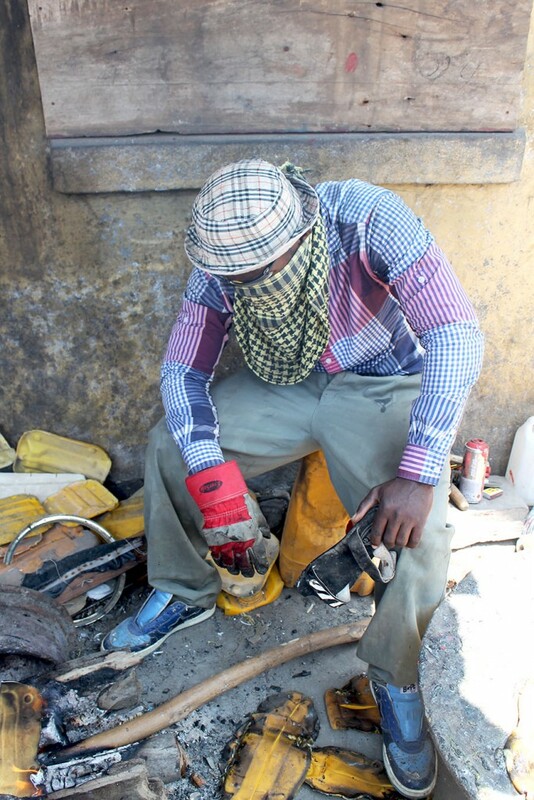 Attukwei wants his community to be part of the project by working with the materials, touching them and so forth. This is a key difference as in a gallery you are not allowed to touch the works. Attukwei wants to invite everybody to see the process in the Labadi studio in order to make the experience more interactive. 15. 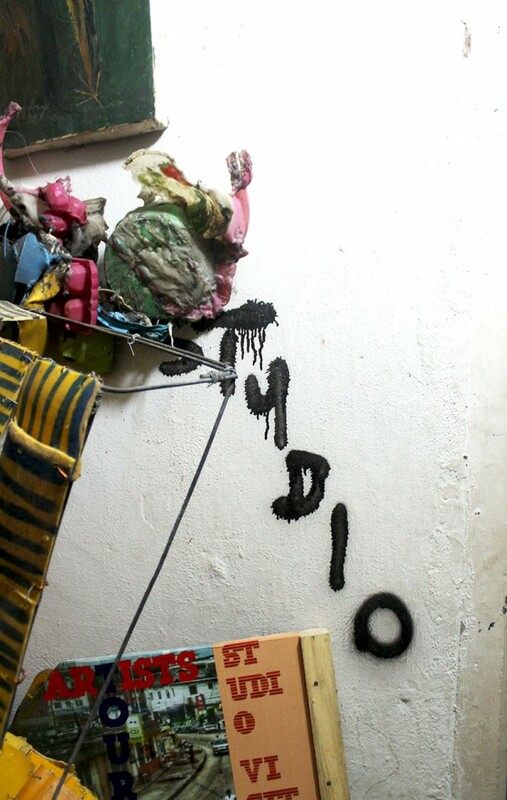 Work on display in the Labadi studio. 16. At the end of the day the art works are all stored inside Attukwei’s home. Serge Attukwei Clottey will be in conversation with Nana Oforiatta Ayim (Creative Director of Gallery 1957, Accra, and Founding Director of cultural research initiative, ANO) on October 6, on the occasion of 1:54 African Contemporary Art Fair (London) Book your tickets. 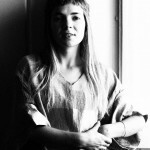 A dreamy, idealistic vegetarian. Currently studying (=experimenting with) art and fashion because I find these are good tools for communication. I am trying to find ways to make people more aware and appreciate the world around them. Lets look around and ask questions.